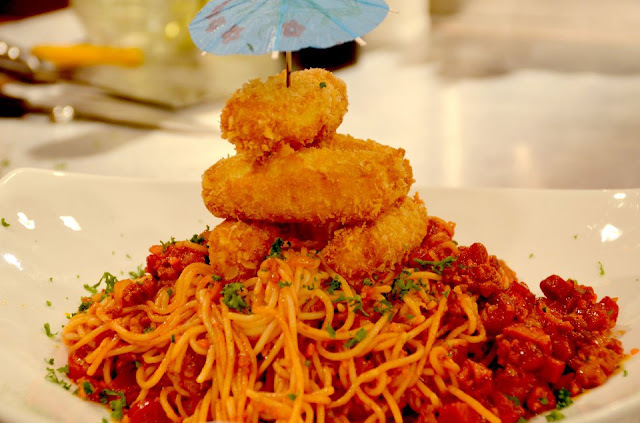 First there's Pinoy Spaghetti with Mozzarella Sticks. Jillian's real-life friends who took time out to join her in this special birthday episode, as well as the invited guests from Nayon ng Kabataan, thoroughly enjoyed not just the all-too familiar sweetish blend of Filipino-style spaghettin but also the totally yummy cheese rods that go with it. 1. Sauté onion, garlic in oil followed by celery, carrots and minced beef. Add tomato sauce, hotdog and catsup. 2. Simmer for 10 minutes and add sugar, salt, pepper and powder sugar. 3. Butter al dente spaghetti. Season with salt and pepper. 4.Place on spaghetti plate over the top with mozzarella sticks.